May 2017 - Pressure sensor Scans! mile mountain ride - go big or go home, right? position. However I felt a bit over rotated and tipped forward. of her bucks and spooks. deal with tipping or use shims with Ava. as it was quite steep for most of the ride. I also took Pico for a short ride in the Roma. just worked perfectly, even over some jumps. and he's been uncomfortable in most treed saddles. Pico and his ongoing riding plans! I tried both the Roma and the Quevis on Csavannah, my youngster. I'm going to tumble over her rump when she moves into the canter. put on my old saddle if it didn't work for me. western fenders - much better option for me! faster work. We had a couple spin/spooks and no instability. I was extremely impressed with the stability of these saddles on both long rides. I expected them to be good "for a treeless." But they were better than that, good, almost exceptionally good for any saddle. I still plan on playing around with different combinations of padding in the pads and adjusting the panels, but after both of these long rides, I felt like I could have done a 50 with no saddle complaints. Next up for testing - Topper! time for a ride, so put my husband on, took pics and called it a day. these checks need to be done with rider in place. much improved, no longer an issue! So next step was to return the saddle to its designed configuration with the inserts back in the pad to create a spine channel. I'd originally removed the inserts because they felt like too much. But now that I'd ridden and seen how the saddles conform to the horse with just a short ride, I needed to see how I felt with the inserts in place - ie - too much side to side instability? bouncing? It certainly does look "up there." But that's what experimentation is all about! High withers certainly seem workable! Now I need to find a roly-poly 55 gallon drum horse! Anyone in Central Oregon have a good test subject? Ok, I found two awesome roly-poly horses! 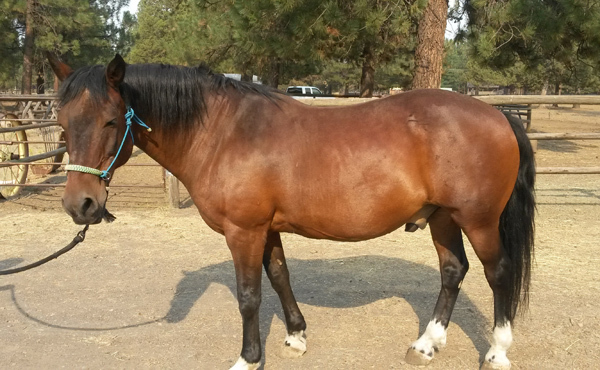 This is Henry, a mustang gelding. to return to his dinner, but no issues. 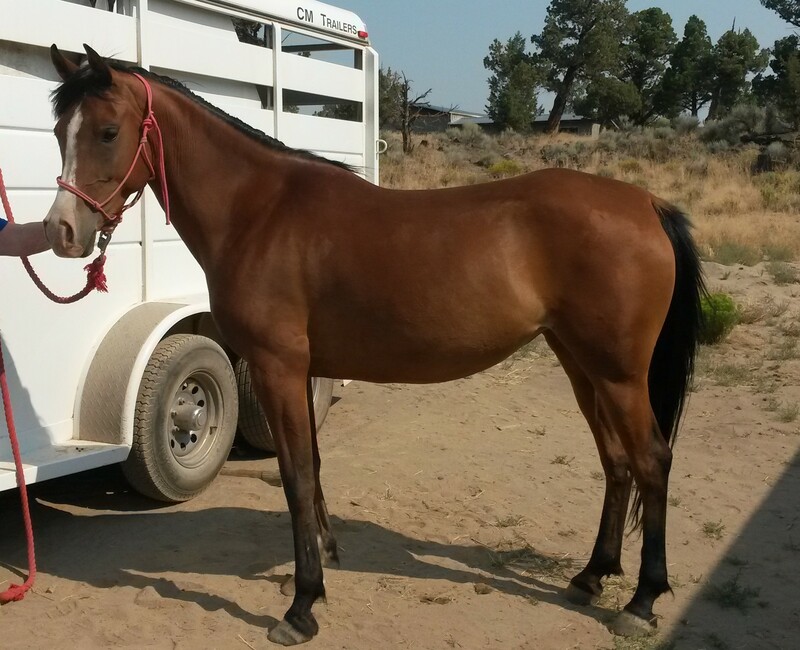 This is Shiloh, a mustang cross mare. Unfortunately, these are all the pics I got. This saddlefitting session turned into a bit of a horse training situation. We put the Quevis on Shiloh, first with the pad inserts in place. 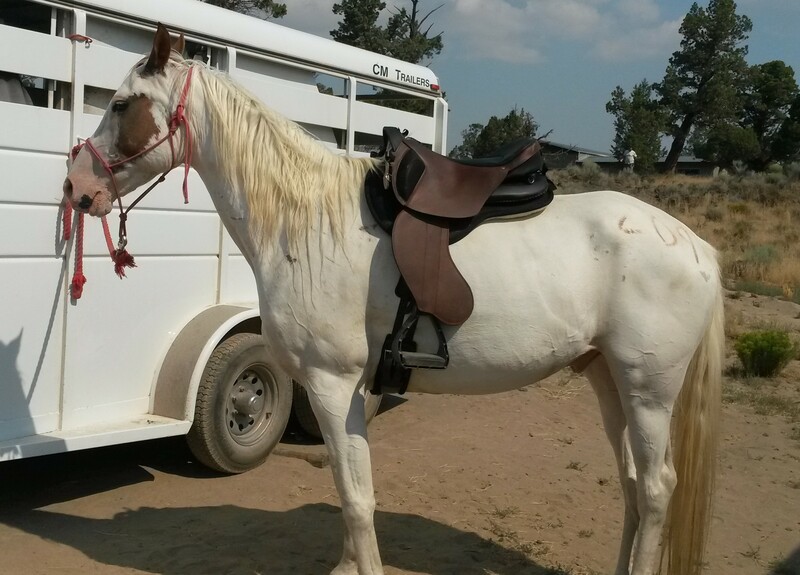 The saddle was perched so high and there's just no chance the saddle will ever touch her spinal processes or withers. So I pulled the inserts out and resaddled. 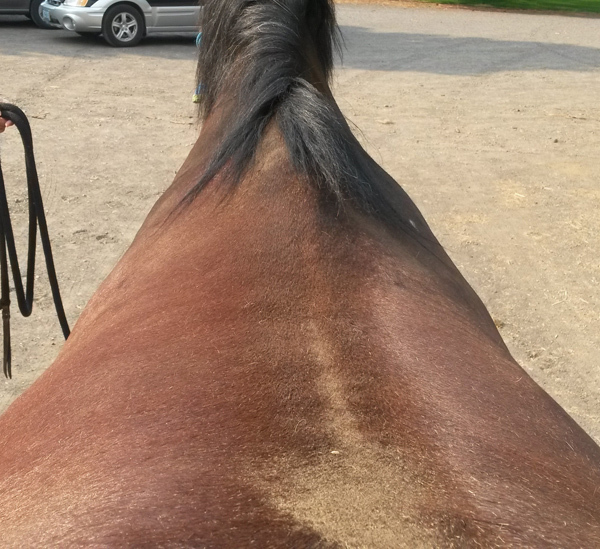 She also doesn't have much of a girth groove, so we lunged her a bit to see if the saddle even could stay in place! AND to see if we could take the edge off her. Shiloh had been moved to the boarding facility just a few days before, along with her three buddies. She's very much an alpha mare and we'd taken her nearly 1/8 of a mile from her herd. She was very focused on that distance. She's had a troubled past, with a previous owner that was scared of her and let her learn she is strong. Very strong. It was clear no one would be riding her, or at least not in a way that allowed photos. So I set aside the phone, worked on manners and forgot to take pics with the saddle on.The owner got called away for a while, so I worked with Shiloh, just trying to get her attention on me. I got a few seconds here and there. By the time the owner returned, I told her we wouldn't be riding, but I did want to see if she could stand next to the mounting block long enough for me to put some weight in the stirrup just to test side to side stability. Well, she wouldn't stand anywhere near the block, so I decided to at least bounce in the stirrup from the ground. Amazingly, she stood still while I stood straight up with zero saddle slippage. I did have the girth about as tight as I'm comfortable with, someone else might have gone one more hole (I LOVE the Ghost girth, the comfort and the grip of the sympanova). Since she'd stood, I decided to have a bit of a stupid moment and try once more with the possibility of swinging a leg over. She stood, I mounted. I did have to recenter the saddle a bit, but nothing unusual. 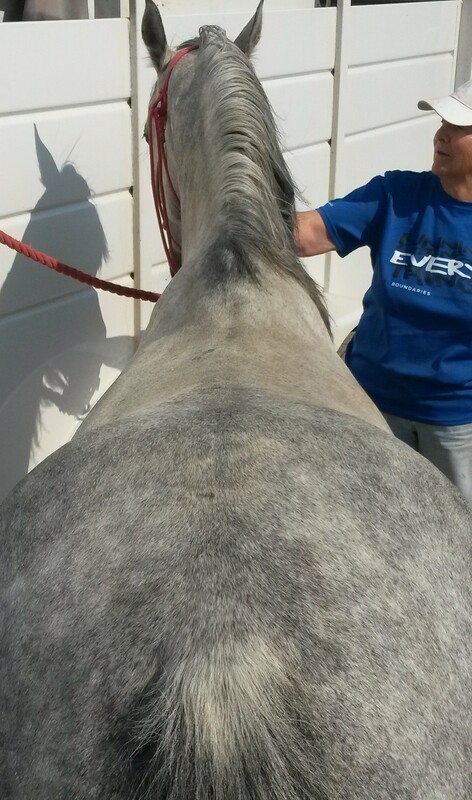 I'd put a bosal with mecate rein/lead, so even though I had the reins, the owner stayed on the lead. We moved in a few circles, just enough to know that the saddle was pretty dang comfortable on this table of a horse. I need a narrow twist, which is still there even though now my legs are around this barrel. Narrow twist for my upper thighs, but my knees absorbed the roundness quite comfortably. We only walked a bit, I was already risking enough. Then she reared straight up. I wasn't worried, still quite secure. As she came down, I pushed her forward, not willing to let her get away with anything. She reared again, but with less enthusiasm. We got a few more willing steps, then I got off! In hindsight, boy, no girth groove! Very glad the saddle stayed in place or I don't even want to think of what could have happened. If I go ride her again (crazily enough, I would like to) I will have a breast collar for sure! And for some reason, I still forgot to take the saddle pic! So here's my summary. The Ghost can be extremely secure on even a wide backed horse. Quite comfortable too. I would immediately do a long ride on Henry without the least concern. With one of Shiloh's herd buddies nearby, I would confidently ride her. I am a pretty balanced rider, I know what it would take to make the saddle slip for me. Not every rider is in the same place. 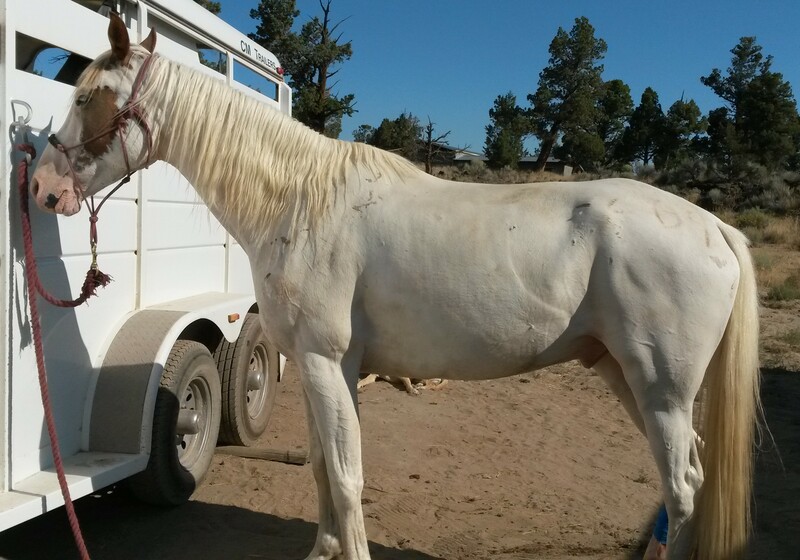 I would not recommend that this owner work through the issues with this horse in the Ghost. If she veered to run back to her herd or took advantage of her and she did get off balance, there is nothing in this horse's structure to stop the saddle from continuing to slip. Wish I'd had a breast collar for that test, but even if a breast collar would keep the saddle from going under, I'm not sure it could prevent it from slipping enough to dump the rider. Once she's worked through these training issues, the mare is very brave and non-spooky and they'd do just fine. By the way - not many saddles would stay in place on this horse either, I just wouldn't want the Ghost to be part of an accident. Additionally - I'm not sure anything but a treeless would actually fit this horse! Wow. High withers, no withers, round, oval, short backed, long backed. All have potential to be a great ride in the Ghost. My next plan is to test things to distribute weight for heavier riders. 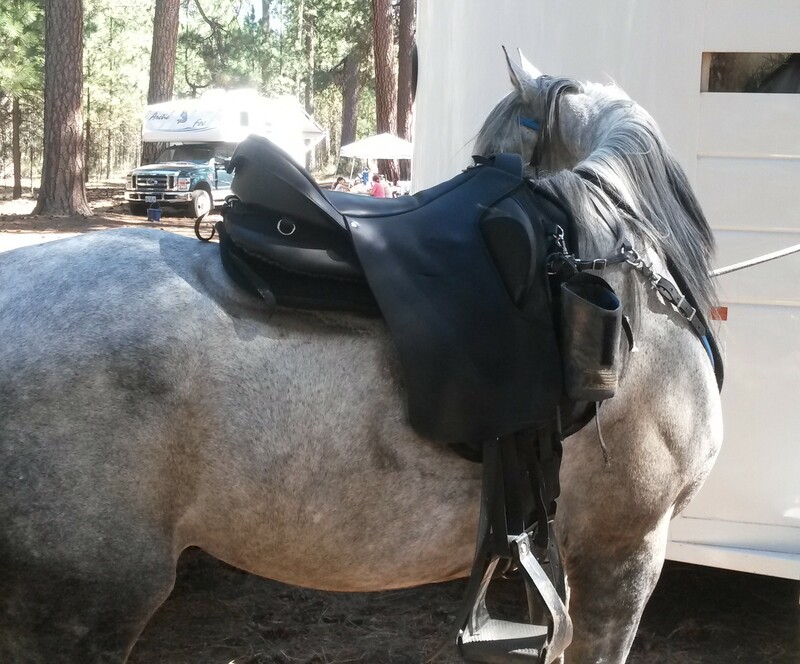 Although we don't recommend that heavyweight rider do long or strenuous riding in any treeless saddle, I want to understand where weight limits make sense and how to improve the ride for the horse in the gray areas. 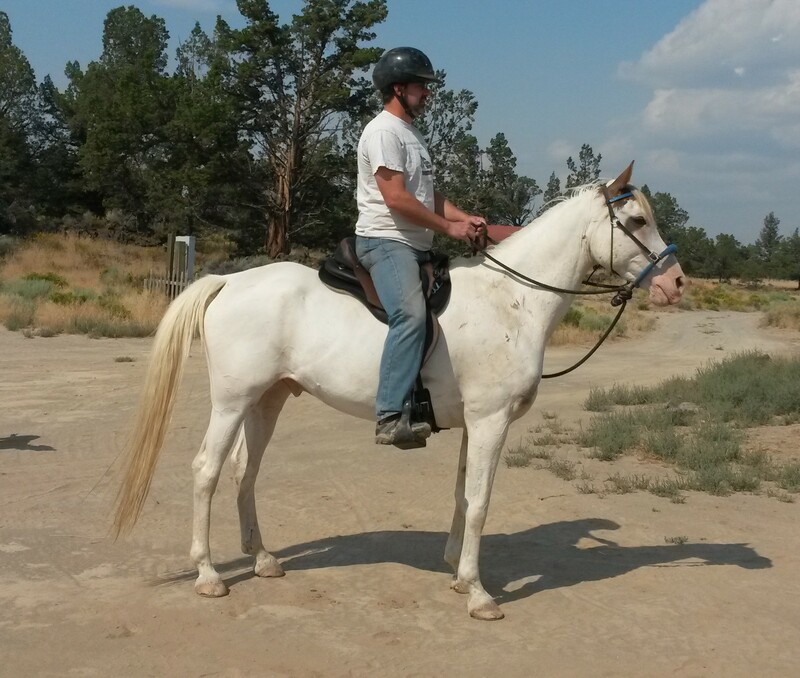 I found a couple small windows of time to ask my husband, Stace, to ride the 18" Quevis on his horse Topper. Stace is 6' and weighs around 220#. Ghost recommends as max weight of around 170#, but there is wiggle room for balanced riders who ride "light." This means people with enough balance and strength to post gently and not land hard on the seat or be easily swayed side-to-side. My husband fits this category although we wouldn't plan on him doing more than help me test. Stace wasn't as immediately comfortable in the saddle just because of the shape of the seat where his seat bones hit. Probably something he could get used to, but he's ridden in very few saddles so is sensitive to changes. We did spend some time feeling the flexibility of the front and back of the saddle to allow for horse motion. 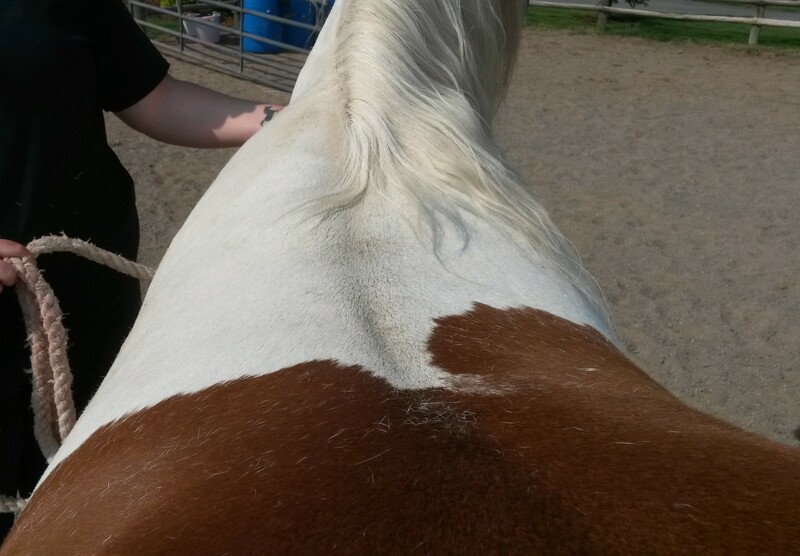 I was please to be able to follow the line of the panels and see that they weren't bent into a "C" but still a nice curve that followed the horse's back shape. He posted a bit in place while I watch for the horse to overly flex with his weight, but he didn't. My husband is very sensitive to how his weight translates to his horses as he's had to balance the fact that compact arabs are generally more suited for endurance, but not always big enough to carry him. He hasn't always had the opportunity to shop for a horse with size first as many of our horses came to us as problem children that needed training primarily. 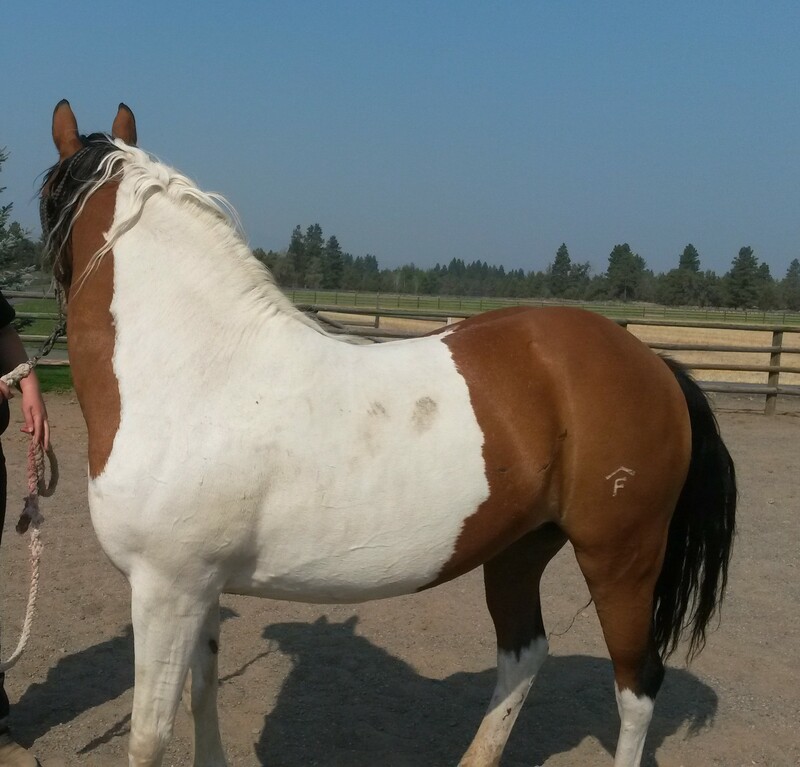 His horse Topper is a 3/4 arab 1/4 saddlebred, 15.3H who moves beautifully and from a stallion we used to own. As Stace rode around, he said that he felt like he could ride in the Ghost without causing his horse problems although he said he'd want to consider different pad options that might transfer weight to an even bigger weight bearing area since his horse has the room for that. I'm talking with Skito to get a pad made for the Ghost models with their laminated treeless inserts. They've got a great design, similar to a treeless pad I designed years ago. So soon we'll have additional options for everyone. I would love to say riders up to a certain weight could ride the Ghost, but I don't have analytical data like that yet. 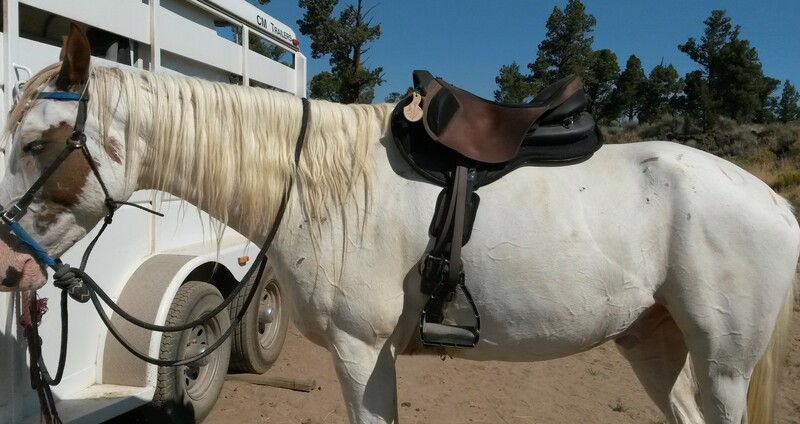 I will say that Ghost saddles won't cause problems from stirrup and girth rigging pressing down on the spine and by feelling under the saddle with my husband riding, I definitely don't feel a point pressure from seat bones. I'm hoping to get a Port Lewis Impression Pad for more detailed analysis. If you're a heavier rider and have some ability to contribute analytically to this study, let me know! Here are some pictures of Stace on Topper in the 18" Quevis. Stace captured a few seconds of my hanging and bouncing for a dismount on our horse Cimarron. The Ghost really is that stable, even on the round horses! Okay this is taking a bit to get uploaded - we're trying to resize the video so we can load it to the server and not take forever to run on most people's pcs. I might put it on YouTube if that doesn't work. Finally, here's the video. Anyway, back to filling the horse conformation catalog! This time I put the word out for a high-wighered horse. I found two and here's the first. 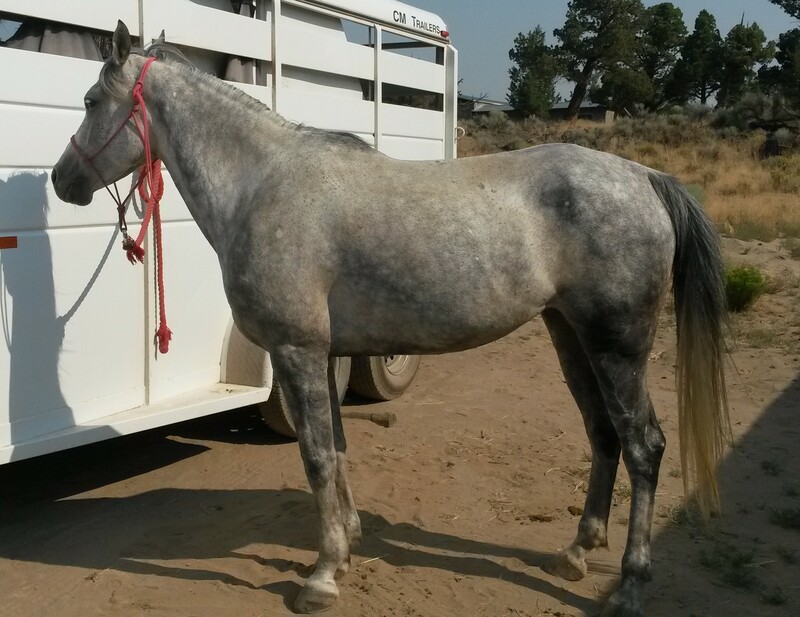 He's an arab gelding with pretty good withers and a more prominent spine. He's not narrow all over though, you can see he's got well-sprung ribs, so a great test for the Ghost - narrow in the front, wide in the back. We put an 18" Firenze on him and didn't have to make any changes to the panels, it sat well above his withers. Then I thought, sure, I can mount a horse with these withers from the ground, even with a bit of a loose girth, I mean heck, look at Shilo above! Nope. Didn't happen. Saddle slipped. So I tightened the girth, still couldn't mount from the ground. The owner was laughing at me - she can't mount this horse in any saddle from the ground. She says everything slips on him. Hmm, interesting. It's not a slippery coat, he's got a decent girth groove. The only thing we could settle on was that his well sprung ribs had an impact. If anyone has any ideas, we'd love to hear them! In any case, I did mount with a bit of terrain helping. Here are some pics, including closeups of the pommel clearance. 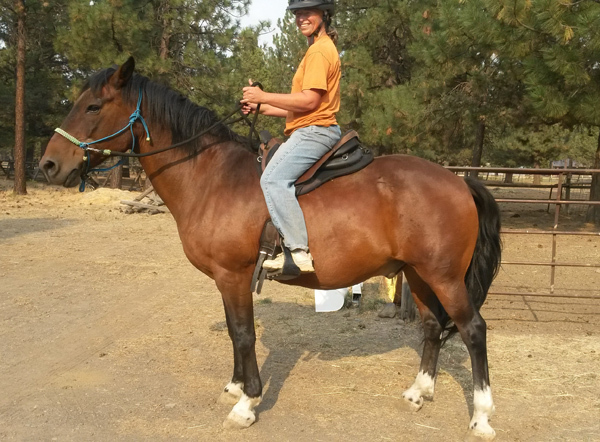 I had a nice ride on this gelding, very responsive. He seemed happy. So we put my husband on, again, not that he would ride long term, but we wanted to test how close the pommel would get with a heavier rider. Not bad! This horse's rider hopped on and she was a great fit for the saddle and the wither clearance was about the same as for me. In fact, while I was sitting on the horse, I ran my hand under the pommel - I could touch fingers with my husband who stuck his hand under the cantle. With an even narrower, higher withered horse, we'd still have room to make a couple adjustments to the panels if needed. We'll find out - I get to test that horse next week! Oops, that didn't pan out. I found these old pictures of a saddle tipped nearly vertically on my young mare Csavannah. 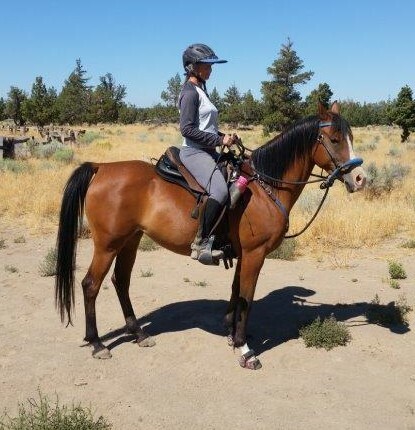 She has pretty narrow shoulders and not much in the way of withers and her previous saddles slid dangerously forward down even moderate hills. For steep ones, I had to dismount to keep from going over her head and then the saddle literally tipped so forward it was standing straight up. Yesterday, we did a 20 mile ride in a Roma. The ride went over a butte and down to a river (and back). Lots of up and downs with some fairly steep sections including some big step downs over rocks. My husband's horse stumbled at one point and the loose ground and steep angle caused him to fall over sideways (luckily only a sore leg from having the horse scramble to stand back up and the horse was fine). Aside from that event, I was almost as excited to realize Csavannah's saddle hardly moved at all through all this terrain. According to the sweat lines, the Roma didn't move more than 1.5" for both the up and down hills! This is hugely tiny! On top of that, this was her longest ride in a long time and she was nicely forward on more terrain than she'd ever done at one time and over the past three rides in the Roma and a Quevis, she has really changed in attitude. She's more forward, more willing to lead, and cantering more than she ever had before. I'm sure part of this is her maturing as well, but these are fairly big mental differences in a short period of time. She certainly wouldn't be behaving like this if she wasn't comfortable as she is a very demonstrative horse. Above - a VERY unstable saddle! Right - a much happier horse ... and rider! to soundess, or let him go back to the bigger difference. have to put weight in one stirrup to keep the saddle balanced. to the shape of the horse and moves with him! Like most treeless brands, Ghost recommends maximum rider weights of 165-170 pounds. I think this is a reasonable limitation for something flexible, but we're always looking at improvements or even the ability to give a better comfort margin for lighter riders doing longer/harder miles. So I'm testing higher weights to make sure we provide better experiences for lower rider weights. I'm working on some pictures, but anything other than the ugliest Impression Pad tests really don't show up in pictures! Which is good to say that even with my 225# husband, we haven't been able to completely clear the dough from the pad. But our hands and fingers do give us more information! We are not trying to make Ghost saddles work for rider's of Stace's weight, but he is being a good sport about being my extreme test subject. He is also building electronic pressure sensing pads to more easily test materials which will distribute weight even better. It's important to note that Impression Pad tests must be done very carefully for any saddle, but especially so for treeless saddles. A poor mount, dismount, spook, or ride focused only on trotting or only sitting will skew results, especially as the pad is well warmed up. But because a treeless saddle does it's best to follow the shape of whatever is underneath it, a dent created by an uneven mount or even a big spook means the saddle will fall into that dent. One of my first IP rides on a Ghost with panels only, no pad and the horse primarily trotting and a couple small jumps gave me a result of a slow ramp down to the front of the pad. I still couldn't take a picture that showed any light through the pad, but I could feel it. Lesson learned! So feel free to ask how this testing is going over the next few months. And more real life testing will be coming as this season's endurance rides start up in April. I'm planning 50's on two different horses, plus one of them should do a 75 and her first 100. I'm very excited about this as I am more comfortable in this saddle than anything else I've ever sat in! We've been generally unhappy with Impression Pad testing. It can be difficult under the best circumstances, and a treeless saddle is not the best circumstance for an Impression Pad! Basically any shift in balance can turn into what looks like a horrible result. The saddle is flexible! If you mount badly, even a little, or the horse spooks, or you ride sloppily for even a couple strides when the dough is heated, a dip in the dough can be created. Fine, no big deal, right that stuff happens all the time! But a treeless saddle will fall into that dip and keep tipping or bending to match it, creating an even bigger hole. When in reality, that little blip would happen and life continues on with no problem. The bigger problem, which I have yet to explain, is when I've set up known poor fits, the IP really didn't show anything at all. Maybe that's ok, maybe the saddle handled the poor fit better than I expected, but I hate things I can't explain! On the same topic - sweat patterns! We endurance riders live by them. We look for that even shape on both sides, the dry spine channel before we even set our saddles down. It's as important as EDPP (sorry, endurance speak for horse doing ok). 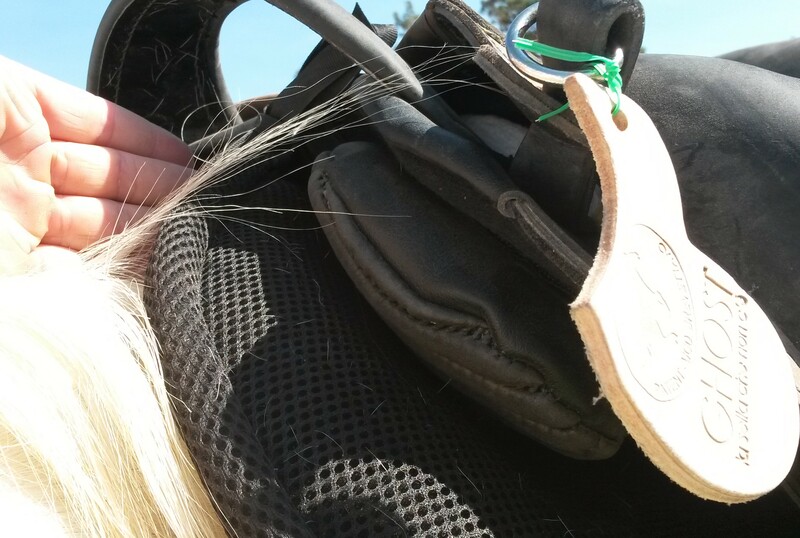 So I'd heard that treeless saddles could give an unreliable sweat pattern - heck, check out this article, the problem isn't limited to treeless. I can kind of get this - the saddles aren't heavy enough to create their own sweat pattern. And some, including Ghost, are designed to be very breathable. The sympanova panel and pad material is breathable, so is the foam in the panels and pads. Additionally, the sympanove has little air channels, so if you've got defined gullet clearance, the horse is moving and shanging shap, the riding is moving, air must be moving - I'm not sure a supercomputer could determine what the sweat pattern should be. We have reluctantly agreed to believe that a large, blotchy dry spot with poorly defined edges isn't bad. We've reached this conclusion because the horses are happy, striding out, gaiting, no sore back, no hot spots. We do get excited about small, round or otherwise very defined spots. the sweat pattern becomes completely wet. recreate a problem with a panel/pad mismatch. So, I can rest easy if I don't see that small defined type shape, right? Nope. Can't stand it, it's driving me nuts. So my husband started playing around with an idea he's had for years. We knew a vet/chiro with an electronic pressure sensor pad years ago. Great information. Some limitations, but as long as you understand that, wonderful tool. Well, they cost about $7000. So we built something much more simple, but still clear, definable data for under $100. The first pad only has 6 sensors set up on one side of the horse and while we can get ongoing data, it has to be attached to a laptop. So quick tests with limited motion only or tests in the house with our fake horse. The next model will hve 24 sensors on both sides of the horse and be portable! Results from that might be a couple more weeks out. But for now, here's what the first one looks like - and thank you to Ava for much patience standing in the hay barn for 10-20 mounts with different pads and shim while the wind howled and rain poured. We were able to move the sensors from this set up to a grouping around where most weight is concentrated for several tests as well. So here's some of the difficulties with pressure sensors. They work on a logarithmic scale - and the company doesn't provide the formula, just a lookup graph. We tried to determine the calculation, but nothing worked exactly right, so we've kept with the lookup to determine pounds per square inch (psi) for the voltage readings. Now, what's good and what's bad? Two things to look at. One is the variation across the saddle. The more consistent, the better of course, but it's treeless, there's only so far you can expect weight to be distributed. Hence the weight limit recommendations for treeless saddles. But what numbers are too high? There are lots of sources ranging from 1.5psi to 2.5psi being the limits at which blood pressure can't fill the capillaries - issues coming with constant pressure for a couple hourse or more. The 2.5 psi range discussions sound more reasonable (ie, not someone trying to push their point), but still, we're talking about horse comfort for OUR sport which is endurance. We might be riding most of 24 hours, so I want to see numbers under 1.5 most of the time with spots of no more than 2.5 - simulating a spook or other horse/rider mismatch in intentions. Hopefully that sounds reasonable. Part of what has driven all this is the above gray horse. She has a very flat back. Not if you look at her spine, but at a line about 3" down from the spine and roughly parallel. Along this line, her back is VERY straight. The Ghost is not. Now to some extent, that's not a problem, the saddle is flexible, there are two layers of foam each in the panels and pad inserts which are flexible, squishable without bottoming out (or changing properties over 0-100 degrees), but still. I'm on a mission to figure out sweat patterns, maybe this is it! So I start working on creating shims. Great as they can be useful for other people too. My material of choice is wool felt because 1) it's easily available 2) not ridiculously expensive 3) natural 4) flexible and soft, but not very compressible - if I want a shim, I want a shim under pressure too and 5) I can shape it will tools in my house. So I figured out a reasonable set of shims for her based upon comparing curves and did a nice long ride with lots of trotting and cantering. I just knew my sweat pattern would be perfect. Nope, still blotchy and random. Now I was really mad. What wasn't I getting? So we pulled out the pressure sensor pad and checked it out. Wow, best readings so far. Everything well under 1.5 psi and very even, just a small shift forward when in posting position, very little evidence of balance issues when I leaned sideways to the point of almost falling off. I just might have to give up. The blotchy sweat pattern is not pressure. Just to make sure we weren't missing something, we put Stace (230#) on little 14.1H Ava. Stace's pressure was definitely into the 2.5 range, around 2.3psi or so. And these numbers do make sense when I do a rough calculation of my weight versus the available weight distribution surface of the saddle. So everything is making sense except the dang sweat patterns. I'm not going to give up testing - because this is FUN - but I'm going to calm down about the sweat patterns a bit. And by the way, we do get tons of people with perfectly good sweat patterns. I think it's a combination of pads, horse shape, horse motion, rider motion - and maybe chaos theory! Remember the conversation in Jurassic Park? Yeah, that's it. Grr! Sorry I've been a bit neglectful of this page recently! Our endurance season has started, saddles have been flying off the saddle racks, and I decided to start testing other pads because people always ask if they can use a pad they already have. A couple general comments about pad compatibility. First, the inserts in the pad, whether fixed or removeable, must support the entire panel. If the Ghost panel sits higher than the inserts in a particular pad, possibly the panels can be widened (but I suggest doing a string test to make sure you haven't gone too far) or else you might end up with a line of pressure which can lead to dry spots and/or white hairs. Second, make sure the pad in question has the characteristics you like across the useful temperature range. Third, it can be more or less important that the pad be designed for treeless if your horse has a prominent spine or wither. Fourth, one feature I really like about the Ghost pads is the ability to tie the pad up into the gullet. Not all saddles have this. Sometimes you can get creative with your own solution, but a pad resting on the wither can be just as damaging as the saddle. The first pad I tried was an Equitex. I wasn't sure I liked it until I sat on it in my office chair for a few days, but it worked pretty well. It tested reasonably well. The only issue we had was that the horse we used it on had a fair amount of side to side motion at his loins and it scrubbed the hair. This was particular to this horse, others did fine. My favorite has been a Toklat Matrix. It tests about 3rd best (after a Grandeur knockoff and the Ghost pad) for pressure distribution, but it did very well for impact protection for a rider still learning to follow canter motion who had sored his horse. At first I wasn't sure about the Poron XRD. It's thin, slow recovery and I worried it would be worse at operating temps. But no, at a fairly low temp guessing under 80 degree, the material changes properties and becomes spongy with a faster recovery time. I'm not sure the holes drilled in it really affect breathability as I'm learning that I get the best sweat patterns with non-breathable pads, but I've also started taking back temps after a ride and haven't seen a problem. We'll keep checking as summer comes on. Speaking of breathability, I tried a Thinline. I must be missing something. It's a bath mat. One of the worst materials for weight distribution that I tested, but I get very wet sweat patterns on an otherwise dry horse. Yay! Not! Grandeur pads have been very highly regarded with Ghost dealers in Europe, but they are hard to get. I ordered one from Action Rider Tack and all they can get is a knockoff from Black Forest Saddles. It looks like a very good copy, but I can only compare pictures. The Grandeur pads have something called moosgummi inserts. Between the insert and another layer of rubbery foam on top of the pad, the Black Diamond knockoff tested the best for weight distribution, slightly better than the Ghost pad. It looks well made, but I would make some changes. The black dye in the wool bled purple on my gray horse, there are no keeper straps for the billets, the straps in front aren't quite enought to hold the pad in the gullet, and the back of the pad curves down. Since it's longer than my 17" Ghost, I don't think it's a problem and I did a 30 mile ride with it, with no problems. I have a Skito pad I need to test, but I just found out that Skito has made one fit for Ghost, so I'll wait until I get it, since the one I have was cut down from a western pad for an english and maybe the lamiinated layers aren't in the best place. It feels hard, so I've just been reluctant to use it even though I know they soften. But if you want to know of a much more rigorous test, one Ghost customer did a 75 miler with a Skito pad and everything came through beautifully. A guy leasing one of my horses is doing so with the requirement that he use either a Ghost or a Free'n'Easy or a Reactor Panel because the horse is asymmetrical. He's the one still learning to follow canter motion so used my Toklat Matrix for a bit. Then he ordered Matrix inserts and cut them for his Ghost sympanova pad. That seems to be working well. I am considering carrying Christ pads. They're popular in Europe, beautifully made. However, they don't sell treeless inserts in the US and the inserts I could buy in bulk are the same as the Ghost pad, so no real value as an alternative except for people who love cleaning sweat and grunge from beautiful wool. Not me. So I am researching different foams to offer as inserts for either Ghost or Christ pads. The one I like the best tests better than everything else by a lot, but it's a custom order which I won't receive until July. Grr. Patience grasshopper. I have also been testing the new Ghost USA, a western saddle. It's lovely. Beautiful soft leather, tooling, stitching on the seat, an etched stainless steel horn, amazing fenders. First western saddle I've ever been comfortable in - a real twist! My test model is an 18" so I used seat spacers and a cantle bolster to get my fit and then had some lovely rides with plenty of cantering. As with other Ghost saddles, the USA will have modular options. With or without horn, seat stitching, or thigh blocks. I LOVE the fender. 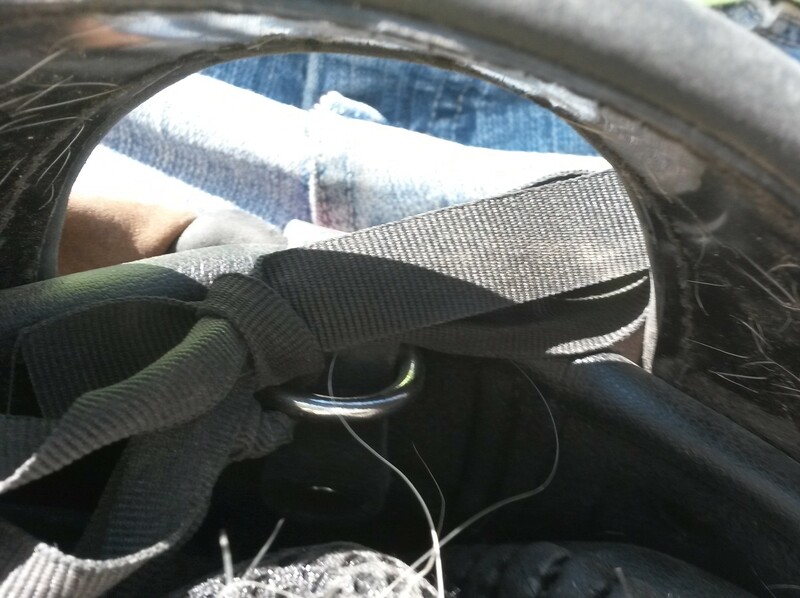 I could pick up my stirrup with my toe from the first ride and it supported my wobbly right leg nicely. My next "perfect" endurance setup will be a Quilty with fenders. I'm kind of thinking I will come up with a new name for this combination (along with the Quevis thigh block set up) and endurance riders will love it. Wow, it's been a long time since I updated this page. I've still been doing lots of testing since Ghost is always making improvements and finding new materials. But nothing earth shattering, just steady improvements in the ability of the saddle to handle harder use riding and heavier riders. Part of that has been a "feeling" as we have denser foams which I tested to have better weight distribution properties with small pressure sensors, but also Ghost changed their production process of the bases once we had achieved the best overall design and that approach made bases even stronger in the area under the stirrups and rider's seat. Most of this occured over the last winter - I still completed several 50's and a 75 with the previous iteration and both horses came through with perfect backs. But I really wanted to put numbers to that feeling so made the leap to buy a pressure sensor system. Fascinating equipment. It has a few bugs - these things are always fraught with nits and technical frustrations and this one was made by a company that really knows pressure sensors but doesn't really know horses. Hopefully we'll help with our feedback. So most of the results I'll eventually get posted here will come with explanations of what outliers to ignore. 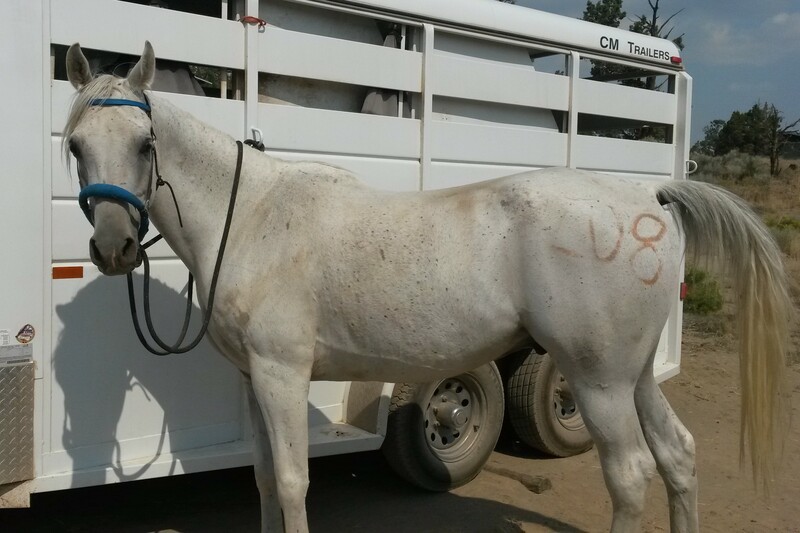 Today's testing involved 2 horses (Csavannah and Topper pictured above with the western saddle), 2 horses (myself at 135 pounds, my husband at 225 pounds) and 4 saddles (2 Ghosts -17" & 18", a Bua, and a Free'n'Easy). I'm going to jot down my overall impressions so I don't forget them and then I'll get into details with pics and video later. No matter how good your treed saddle is, if it doesn't fit your horse, it doesn't fit your horse. We did learn with Topper's FnE that it's time for us to refit as his shoulders have developed over the past year and there might be some asymmetry going on as there is more pressure on his right shoulder. Interesting point, this showed up to a lesser degree with the Ghost which probably tried to adjust but Stace's weight is too much (I still will never recommend a 220 pound rider for treeless!) and wasn't even noticeable on the Bua. I think there's 2 reasons for this - the Bua is designed to stay behind the shoulder motion and also the panels have an ability to follow angles on the fly. The Bua is set up for my "curvier" girl Csavannah and Topper has a very flat back so there is more pressure in the middle, but really not bad. The FnE showed signs of bridging although slight, we'll watch that to see if Topper carries himself better on the trail vs going in circles in front of a chicken coop as generally I want him to have some room to round up into the saddle. In other words, in spite of some annoyances, this system tells us a lot about saddle and rider balance too. As I mentioned, 225 pounds is too much for treeless although I was really rather impressed that the average psi was quite reasonable and the overall coverage area was in the range of 250 in2. Scans looked very good standing and walking, but trotting showed intermittent pressure higher than I liked - but keeping in mind Stace puts a LOT of weight in his stirrups when trotting. For my weight, it was fabulous. The Ghost shows the biggest changes of contact area during stride with a heavier rider but a smaller range with a lighter rider as the saddle follows the shape changes better. This changes with trotting since I also go into a forward seat so lose contact at the back of the saddle. I was remarkably impressed that neither Ghost or Bua showed evidence of my rather sloppy mounts. Csavannah is kind of getting into this endurance thing and pretty much ready to go all the time. We'll have to work on that. If I had to pick best saddle for Stace and Topper it's either Free'n'Easy or Bua, but both need to be adjusted for the horse. Any of the three can work beaultifully for me and Csavannah, with of course the treed saddles adjusted properly. I'll get more stills and videos up soon. The videos are pretty long so I'll grab indicative clips and some stills that show some overall impressions as I have time. Here's a couple from Csavannah on the Bua and Ghost when trotting.